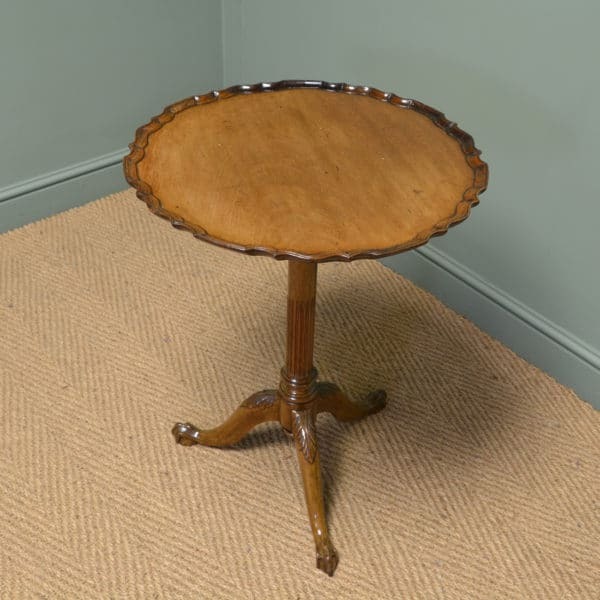 During the Edwardian period dating between 1900 to 1901, the Antique Edwardian Table was at the height of fashion with earlier influences being introduce like the Chippendale ball and claw foot or the Hepplewhite tapering leg with spade foot. Edwardian tables were most popular in the Dining room, as dining and entertaining was a big part life during this period. Several different designs were made to accommodate this, from the large extending dining table to the smaller circular occasional lamp table in fine woods, usually with decorative inlay or unusual carved edges. The cabinet makers choice of timber was either solid Walnut, Oak or more commonly used Mahogany with satinwood cross-banding. Furniture from this period, was starting to be mass produced as the introduction of new wood working machines, help to speed up production but they were still built to last and solid enough to be used on a daily basis. Have a look below at our lovely examples available for sale. 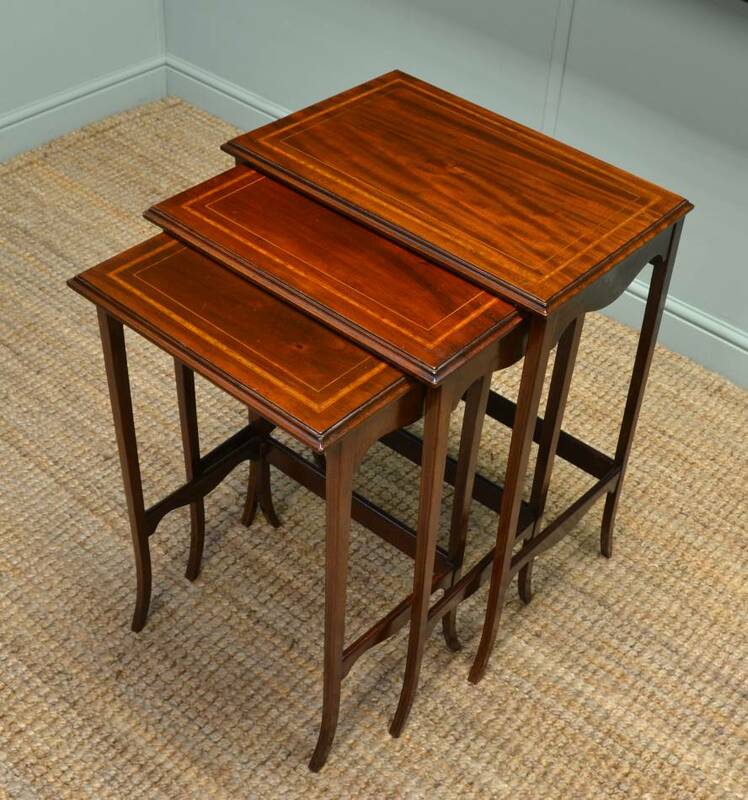 below are some examples of Edwardian tables that we have sold, if any look of interest let us know and we can try to find you something similar. 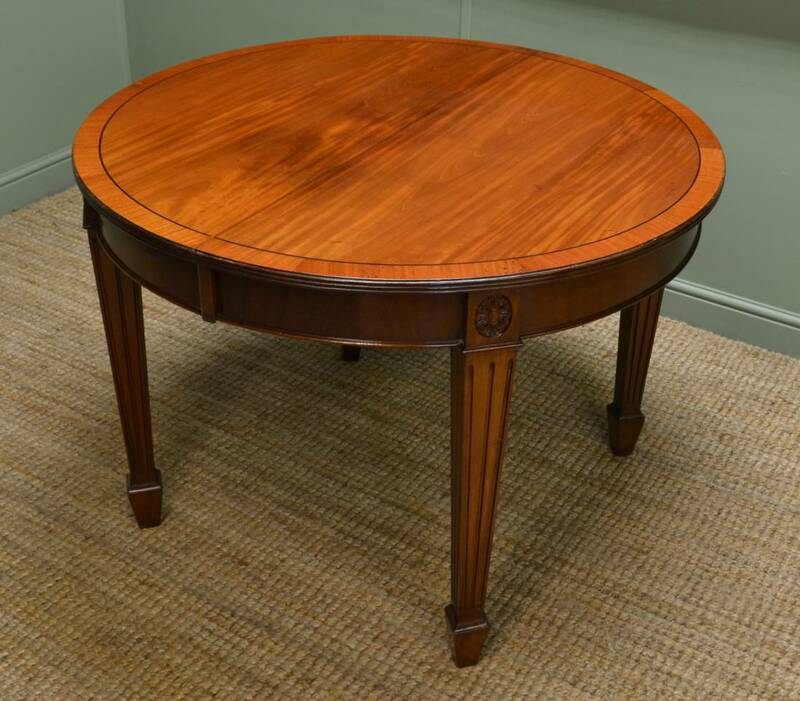 Beautiful Shell Inlaid Edwardian Mahogany Antique Occasional Table. 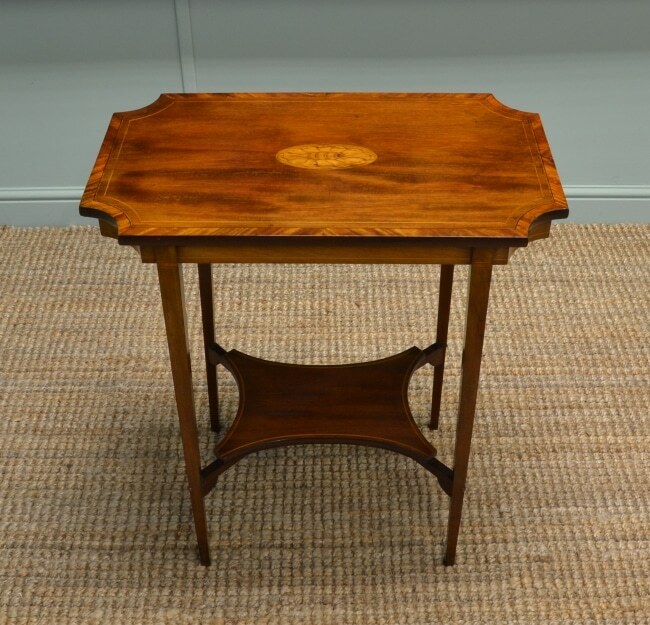 Dating from around 1900 in the Edwardian period this is a beautiful antique occasional table made from mahogany with a delightful shell inlay decoration. The top is rectangular with inverted curved corners edged with cross banding and boxwood with ebony string inlay. The centre is inlaid with a lovely shell decoration. The antique table stands on four tapering legs with a lower shaped tier and has a distinctly elegant look. 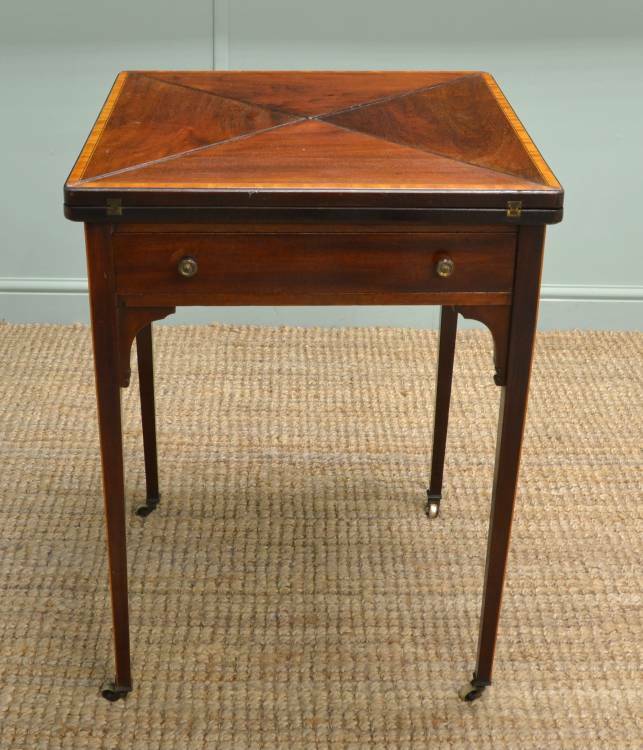 Edwardian Mahogany Inlaid Antique Envelope Card Table. 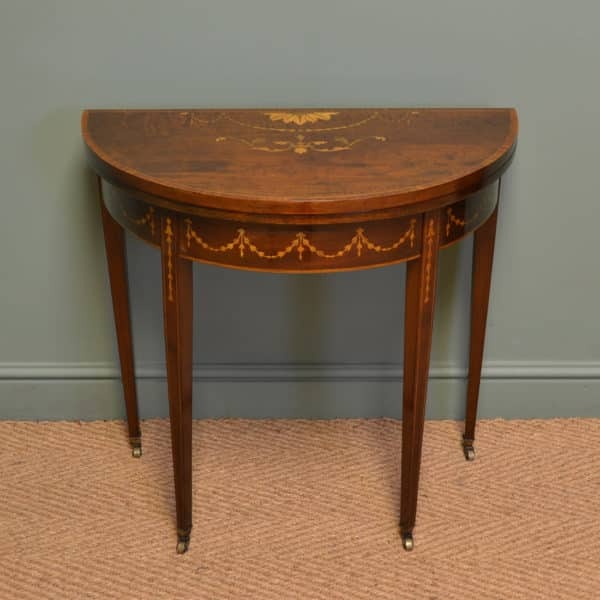 This Fine example of an Edwardian Mahogany Inlaid Antique Envelope Card Table dates from ca. 1900 and has an envelope top with beautiful satin wood cross banding, ebony and boxwood string inlay. 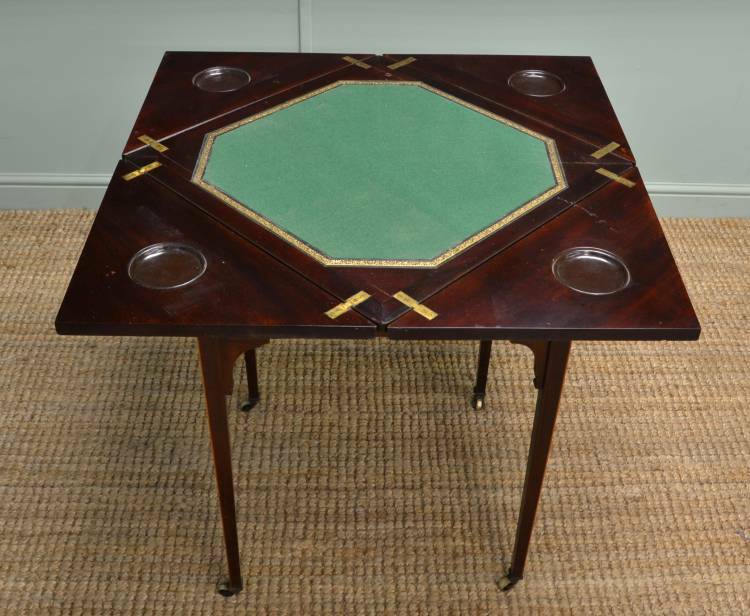 The top swivels and opens up, revealing green baize playing surface and counter wells. It has a mahogany lined central drawer with brass handles, stands on four tapering legs with decorative shaped corner brackets and small brass castors. 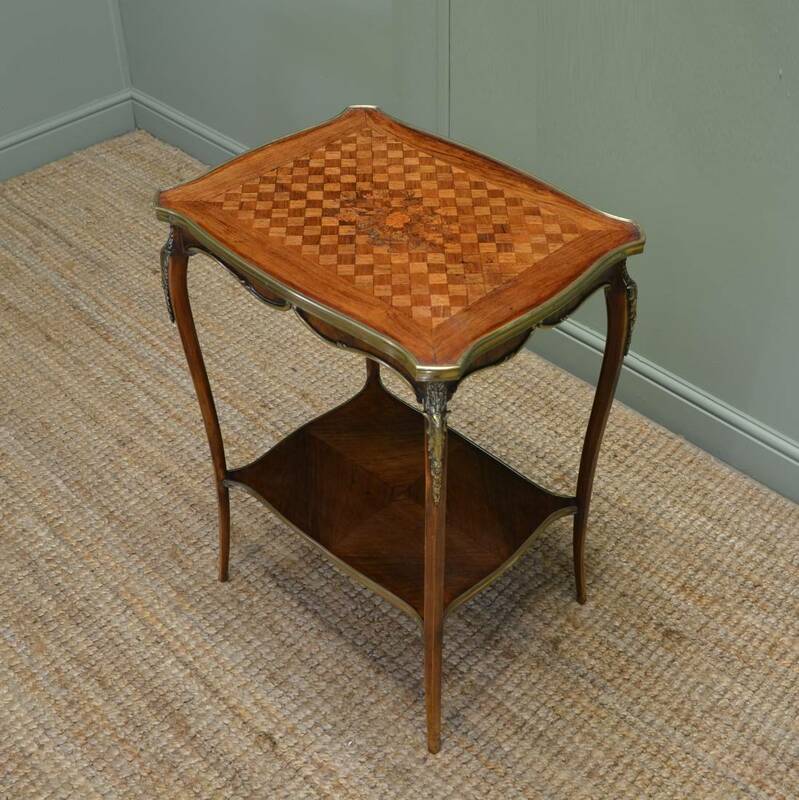 Superb Quality Inlaid Walnut Antique Edwardian Occasional Table / Side Table. 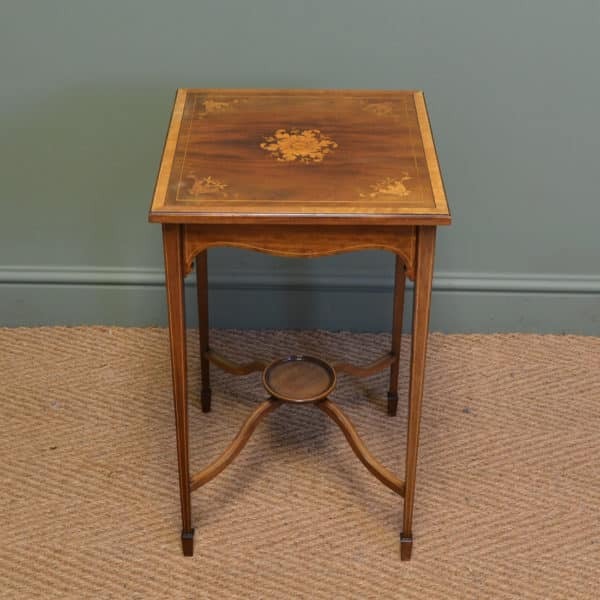 Dating from around 1900 in the Edwardian period this delightful antique occasional table is of super quality and displays wonderful inlay decoration. The beautifully figured top combines both marquetry and parquetry to create a fascinating piece edged in brass. The apron is elegantly shaped, and also edged in brass along with decorated brass mounts to the hip of each leg. The table would make an ideal occasional table or side table, being an attractive eye catcher for any room. It stands appropriately on cabriole legs and has a lower, beautifully figured, quarter veneered, shelf. 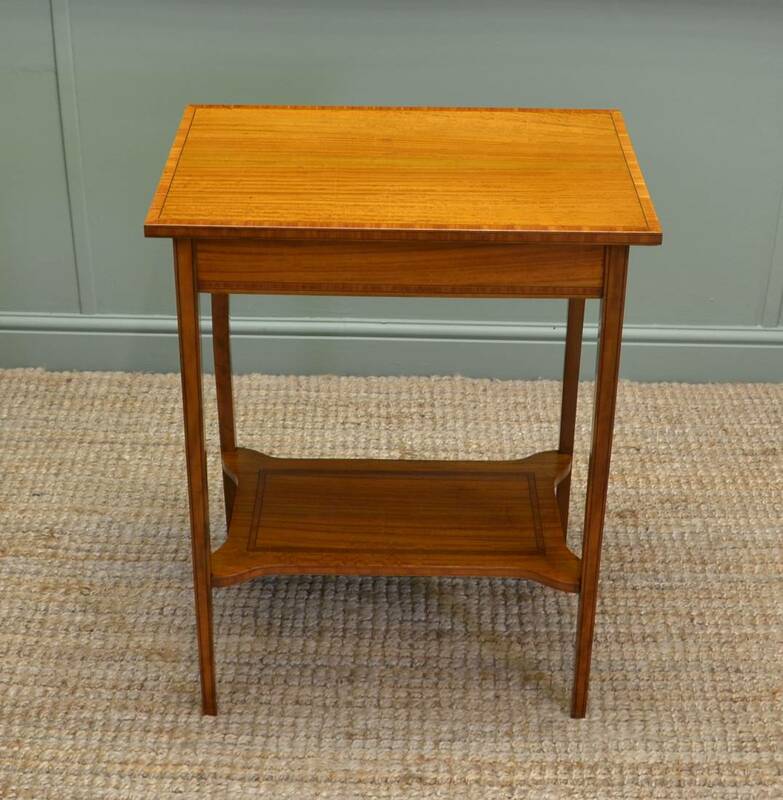 Stunning Quality Edwardian Satinwood Occasional / Side Table. 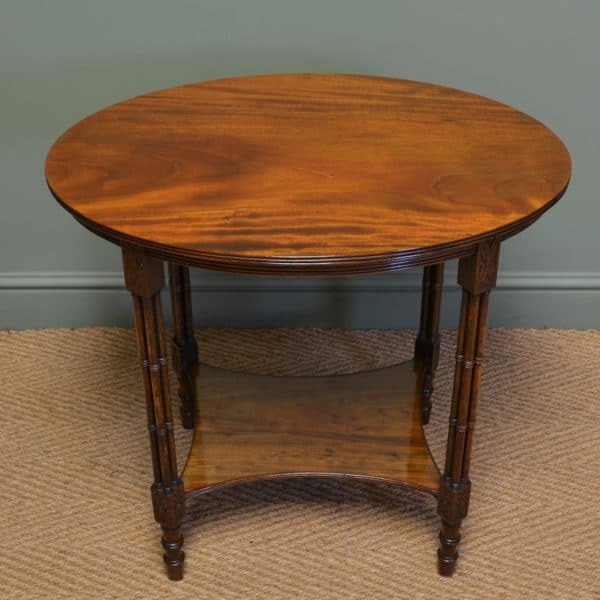 This Stunning Quality Edwardian Occasional / Side Table is made from superb quality satinwood and dates from around 1900. It has a beautifully figured top with cross banding along with ebony and boxwood string inlay around the edges. 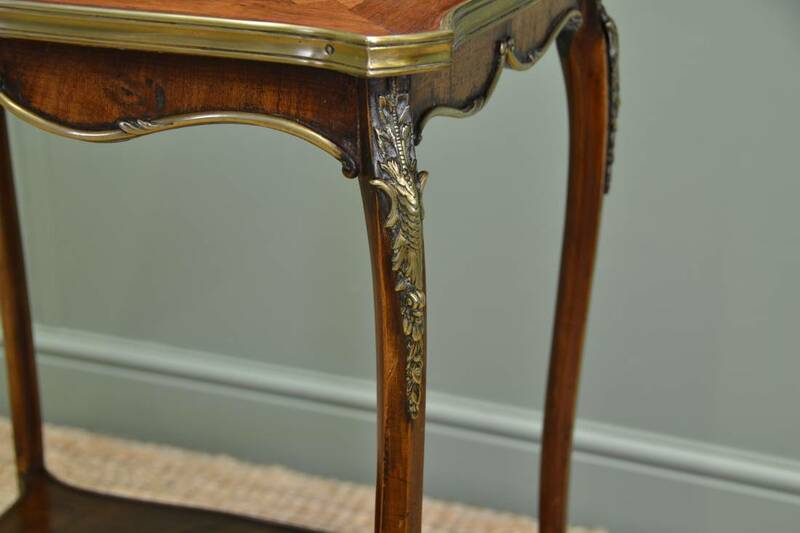 The apron displays beautiful cross banding whilst a delightful lower shaped tier is not only an additional useful and decorative feature but also provides added stability to this antique table. Edwardian Walnut Extending Antique Dining Table. 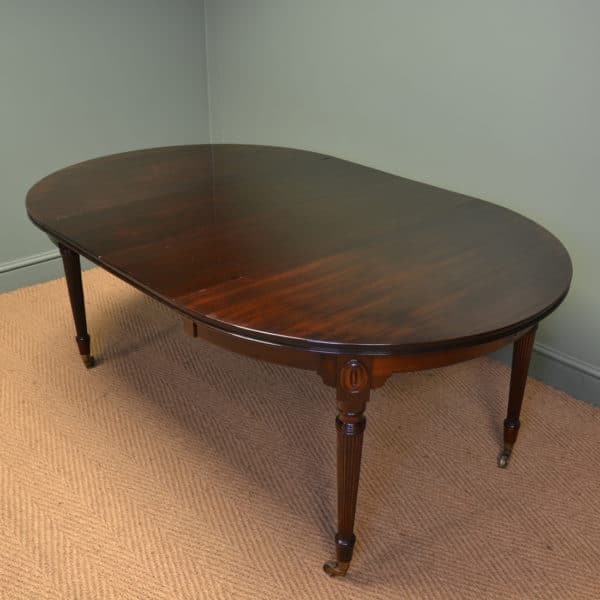 This beautiful antique walnut extending dining table dates from the Edwardian period, circa 1900. The solid walnut top is beautifully figured and edged with mahogany cross banding along with ebony string inlay. It benefits from two additional leaves and extends using a winding mechanism operated by a winding handle (included).When closed it is a very attractive circular dining table with a moulded edge above a deep apron and stands on four tapering legs with spade feet and a decorative carved motif to the hip. 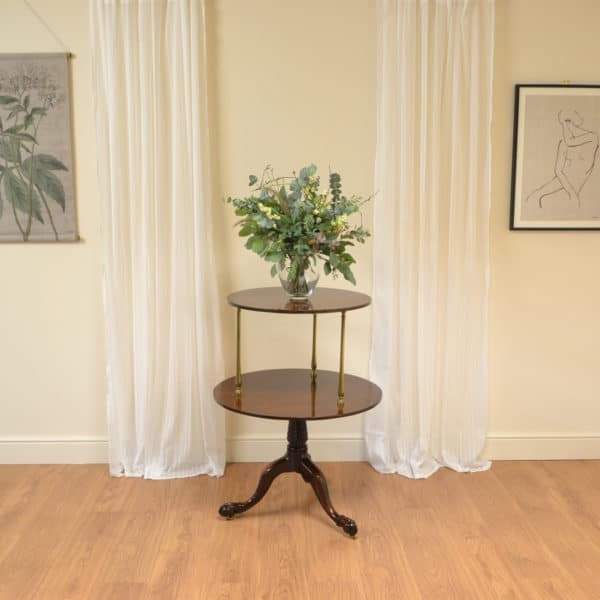 The additional leaves also include the deep apron so when the table is at its full length it is not obvious it is an extending variety, this is a true sign of quality and craftsmanship. 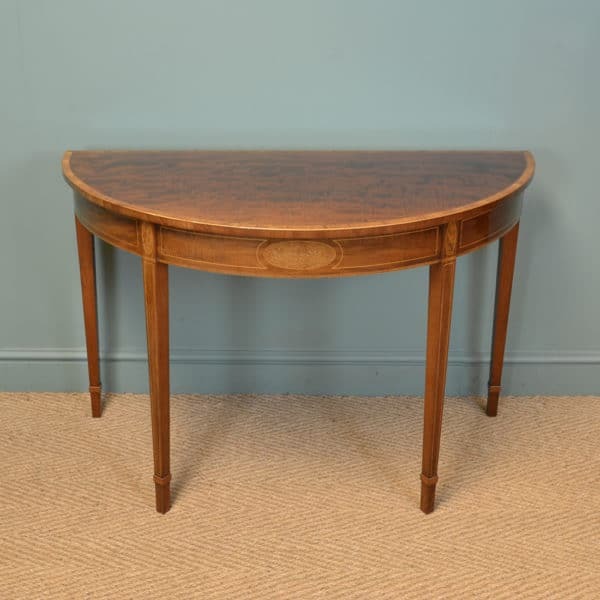 Large Edwardian Mellow Mahogany Antique Writing Table. 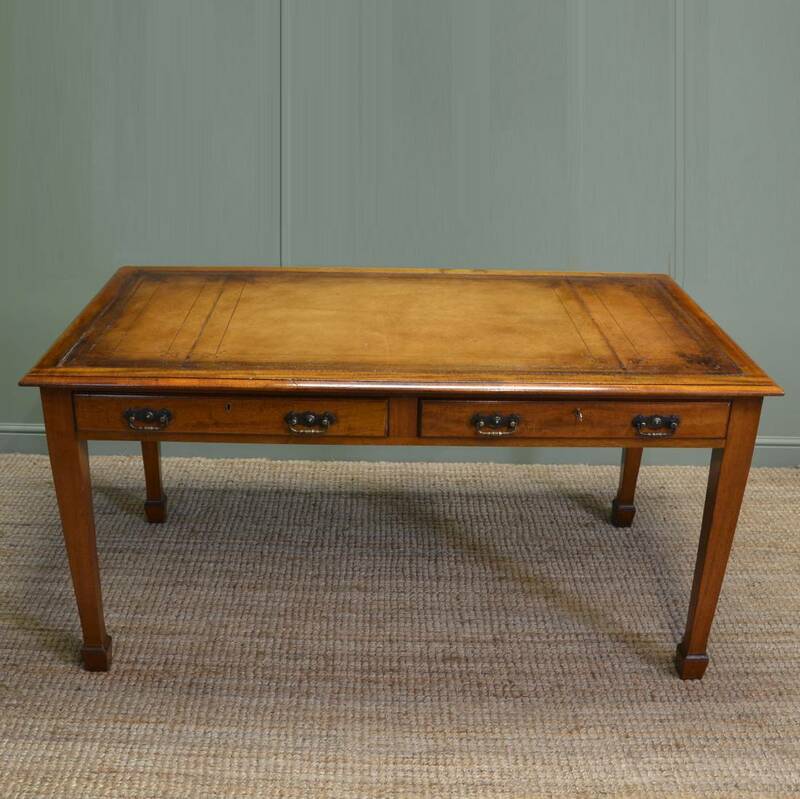 Dating from around 1910 in the Edwardian period this delightful writing table / desk has a rectangular moulded top with central tooled leather writing insert above two drawers with keys in working locks. 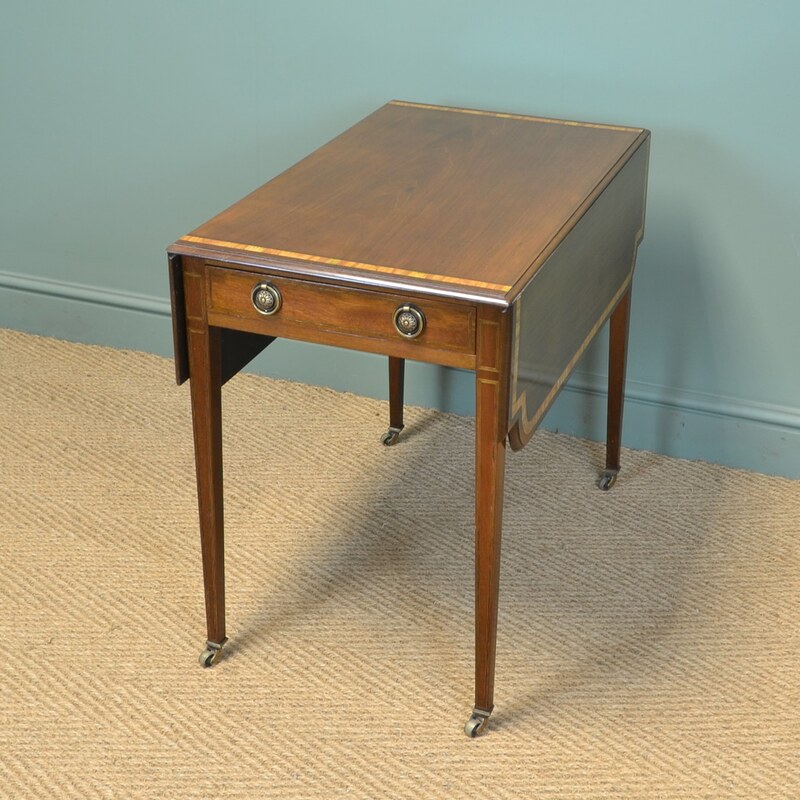 This charming desk has wonderful arts and crafts style brass handles and stands on four tapering legs with spade feet. 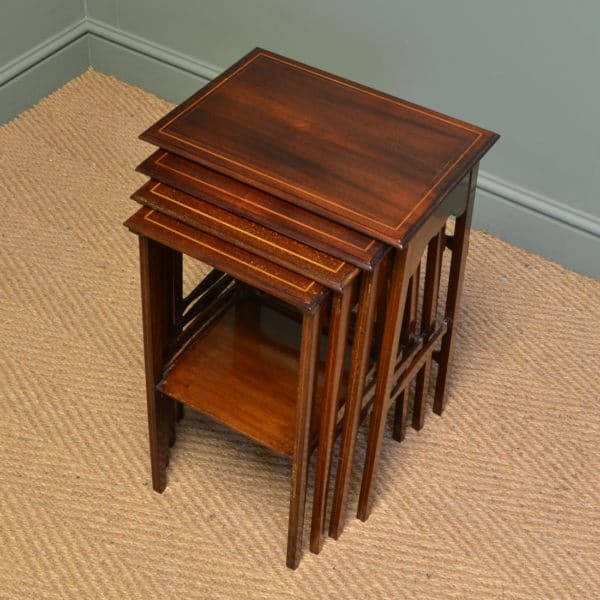 The mahogany has aged to a wonderful warm mellow, shade with a striking grain, good patina, is in very good condition and has been beautifully cleaned using a traditional form of wax finishing.